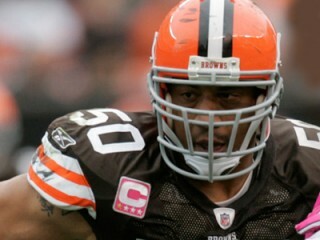 Eric Barton is an American football linebacker for the Cleveland Browns of the National Football League. He was drafted by the Oakland Raiders in the fifth round of the 1999 NFL Draft. He played college football at Maryland. Originally drafted by Oakland in the fifth round (146th overall) of the 1999 NFL Draft…Signed by the New York Jets as an unrestricted free agent on March 6, 2004…Signed by Cleveland as an unrestricted free agent on March 13, 2009. A co-captain on defense, started the first eight games at inside linebacker and racked up 58 tackles … Also defensed two passes and recovered a fumble… Was placed on injured reserve on November 10 with a shoulder injury sustained in game at Chicago (11/1). Game 1 vs. Minnesota 9/13: Made his Browns debut by starting at inside linebacker… Totaled eight tackles, including six solo… Also played on special teams… Game 2 at Denver 9/20: Led club with eight tackles, six solo… Game 3 at Baltimore 9/27: Registered six tackles… Game 4 vs. Cincinnati 10/4: Registered a season-high nine tackles… Game 5 at Buffalo 10/11: Posted six tackles, a pass defensed and a fumble recovery, which came on the final play of the game… Game 6 at Pittsburgh 10/18: Notched a season and team-high 12 tackles in addition to a pass defensed… Game 7 vs. Green Bay 10/25: Racked up seven tackles… Game 8 at Chicago 11/1: Produced two tackles before leaving the game permanently in the second quarter with a shoulder injury… Game 9 vs. Baltimore 11/16: Was placed on injured reserve on November 10 and sat out the remainder of the year. Four-year letterman at Maryland (1995-98)…Recorded more than 100 tackles as sophomore, junior and senior, which landed him fourth on Terps’ career tackles list…Led ACC in solo tackles as junior and senior…All-ACC first-team selection as senior who led conference in total tackles (159) and average tackles per game (14.5)…Only true freshman to play for Maryland in 1995, posting 18 tackles…Majored in criminology and criminal justice. A native of Fayetteville, NC…Attended Edison High School in Alexandria, Va.…Earned All-America honors from National Recruiting Advisor and All-Atlantic Coast recognition from Blue Chip Illustrated Magazine and was rated 10th-best football player in Virginia by Super Prep Magazine. View the full website biography of Eric Barton .